Under what rock have I been that I didn’t realize The Walking Dead comes back in FIVE DAYS! First I found a quarter and now this! Everything is going my way today. 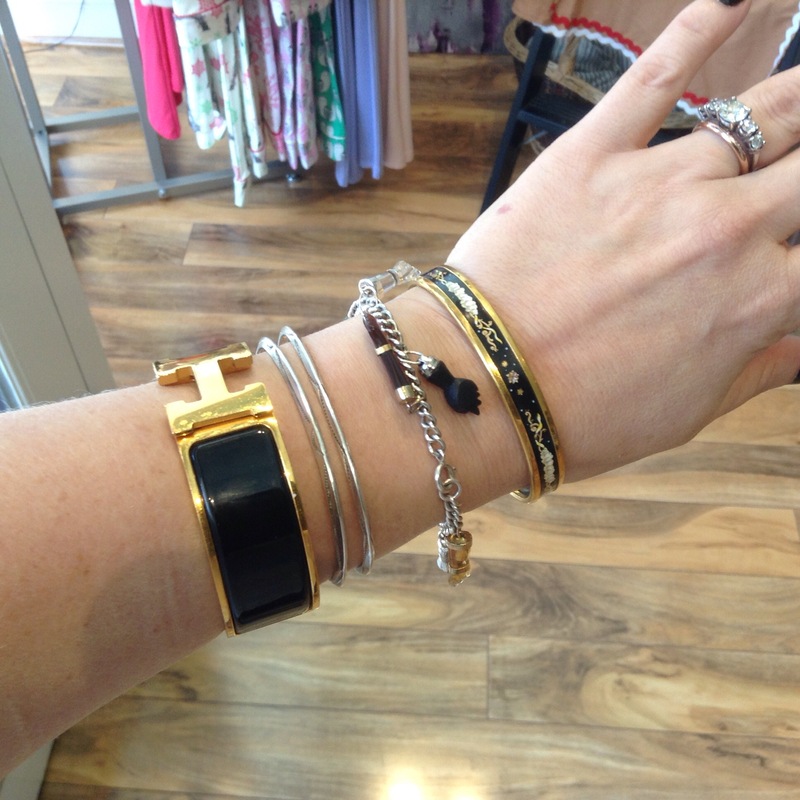 Today’s bangles: black Clic-Clac, two little Native American cuffs of mine from back in the day, my lucky figa charm bracelet, and the Fontaine de Bartholdi skinny bangle. < Previous What does it mean to be a dog lover? I have a very good friend who watches this and keeps me abreast. I am one who likes cop shows, CSI, Stalkers and the Forever series. I need to head home from the library to see the NCIS New Orleans, soon! I like horror movies, but mysteries are my favorites. Just letting you know my t.v. taste buds! Enjoy The Walking Dead, keep me informed from time to time, smiles! I think I’m like Robin, cop shows, Bones, mysteries and assorted cowboy westerns. I do enjoy listening to the Walking Dead, definitely from my era, but I sang backup with Skynyrd once and it’s just not my scene. Enjoy the concert though. I love Bones too! What cowboy westerns do you watch? I’m always looking for good recommendations. So I’m not familiar with the Walking Dead band, but what I’m super into is the TV show. It’s a zombie theme, but I would call it more drama than horror. If you can tolerate the corpses on Bones you can probably tolerate the gore on the Walking Dead. So cool about Skynyrd- my fingers are crossed that you sang Freebird!! I was so scared out of my wits I don’t even remember what I sang, just a bunch of background sounds, ahhhs and oooos in a rock style. I guess I’m thinking about the Deadheads running around the country, still following–oops, I’m thinking about the Grateful Dead. Huge difference there. Most of the westerns I watch are the oldies from the black and white era. We get a channel that has Wagon Train, The Guns Of Will Sonnet, Cheyenne, Kung Fu, Wild, Wild West, and others from that time. Another channel has Gunsmoke, Big Valley, Bonanza and others like those. Mostly daytime, but it keeps me off the street corners. Most of the Westerns had the ladies in the saloons, but that would make a good modern one. Wonder who would play me? I hope the second half of the season is stronger than the first! I was rather disappointed, considering how the last season ended. How have you liked it so far? This season is kind of choppy, isn’t it? I’m someone who generally likes entire seasons but have individual story lines that I’m not into. Like the preacher guy, dude needs to be kicked to the curb. Ha yes – I was really into the hospital thing, seemed super interesting, but hate how they built up the Beth storyline to end it like that. That was brutal but I was so worried that Carol was going to get killed off, so in a way it was a relief that it was Beth. Who’s your favorite character? Michonne, so much depth to her! Okay so I see by these other comments I’m now to list my favorite tv genres: hot people, british hot people, don draper, spooky, pbs-ish. So I was watching this week’s episode of Supernatural and the storyline was Hansel & Gretel… Guess who was cast as the witch/cook? The cook from Downton Abbey! Awesome! I love that. I started Happy Valley and the sister from Peaky Blinders was in it and I was pumped. I still haven’t started Happy Valley, is it entertaining??? I hate being inbetween shows. I keep watching a single episode of various things then turning it off unhappily.